Did you take a summer vacation and find a lot of carnival and stretch glass treasurers that you will share with other HOC members? We traveled almost 7,000 miles in five weeks trying to hit every antique shop and glass convention possible. Antique shops in the Midwest and East are larger than grocery stores in the West! Yes, we did have to pass by many shops without stopping or we would still be on the road! The most interesting shop that we stopped at was in Shelbyville, Kentucky. In 1798 a girl’s school was opened and was in continual use as a girl’s school until 1939. In 1961, they started renovating the entire building to turn it into an antique shop. It is amazing to walk through. The first convention, was ICGA in St. Louis, MO. It was so much fun and the first people we met were friends from home. Had a great time and renewed many old friendships and made lots of new friends. All of the talks were very informative and interesting. Roger Dunham was in charge of the club display of mugs and loving cups. Didn’t know there were so many iridescent mugs and loving cups! There were many wonderful displays in the rooms. Jan and Jim Seeck brought wonderful pieces of glass from the Tarkington’s collection to auction off. If you are a carnival glass collector and have never been to a carnival glass convention, the ICGA convention would be a good convention to go to. They specialize in friendliness as well as education and delicious food. During the ICGA convention, we received a phone call from a cousin stating that our neighborhood was on fire. The electricity had been out for @ 5 hours. Around 1,000 acres burned and they had it contained a very short mile from our house. No houses were lost nor were any domestic animals lost. Even now as we drive by the burnt area, it was an amazing job that the firefighters did to save the houses and animals!!! While on the glass trail, we visited the Wright-Patterson Air Force’s Museum. They have four hangers of planes; everything from the Wright Brother’s plane to space missiles. It was special to hear the veterans tell their family and friends about flying in the planes. Best part of the museum was that it was FREE (yes we do pay for it with our tax dollars). Afterwards, we drove through a cemetery where the Wright Bros are interred as well as other famous people. Down to Marietta, Ohio where the Stretch Glass Society and the National Fenton Glass Association conventions were held. The next afternoon after we had unpacked, someone said there was a van in the parking lot with a flat tire; guess whose van that was? The SGS had one of the most amazing displays of green stretch glass coordinated by Bob Henkel; many pieces we had never seen before. Kathi and Galen joined us. They are a lot of fun even though they had meetings in the middle of the night! We share Kathi’s love of celeste blue stretch. 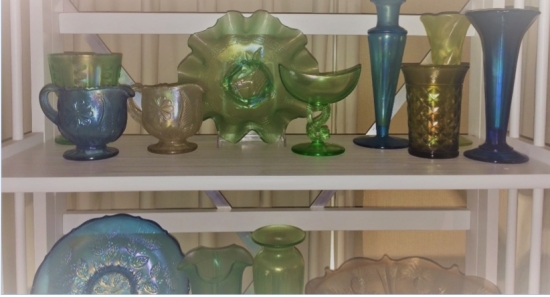 Tom and Debra Burns brought a wonderful collection of stretch and Fenton glass for us to bid on. If you are a new or old stretch glass collector, the SGS Convention would welcome you to attend next year. 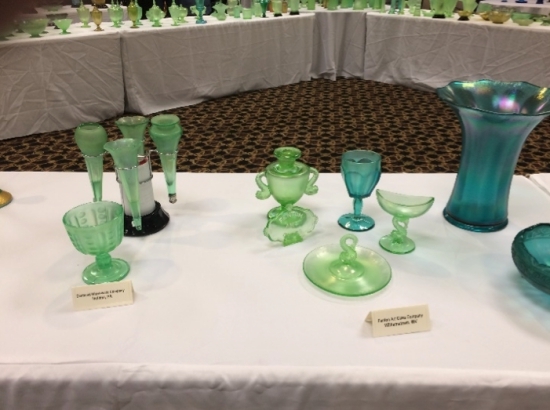 The National Fenton Glass Association started right after the close of the SGS convention. Many collectors took advantage of both conventions. Lots of very informative talks and displays of Fenton Glass including carnival and stretch glass. 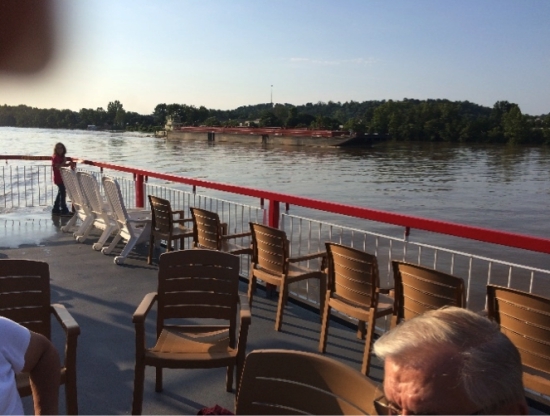 They had a wonderful cruise with dinner down the Ohio River. Beautiful sunset and scenery as well as lots of wonderful people. It was so relaxing. One of our friends said that they were married on the boat a couple of years ago. The town of Marietta, Ohio was founded in 1799. It is a beautiful small town along the Ohio River with Williamstown, West Virginia across the river which was the home of the Fenton Art Glass Company, before it closed. 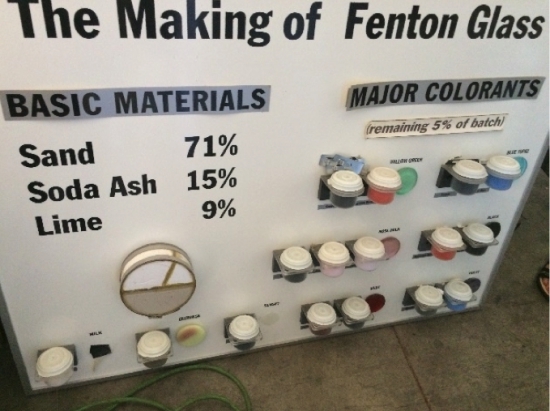 Really miss the Fenton factory and of course Frank, Bill and Don. Whenever, we were coming to visit, Frank would have the light table with lights all set up for us in the back room with the doors open to all of their glass storerooms. He would bring lunch in so we could photograph for as long as we had film – nothing digital in those days! We sat in front of the empty factory remembering the good old days. It was so sad to see everything vacant; even the parking lot was inhabited only by weeds. Last time we were here, they were celebrating the Fenton Art Glass Company’s 100th birthday. There were Fenton Collectors all over the place! Guess we sat there too long as the Williamstown police watched us and then followed us around till we entered the bridge back to Marietta. 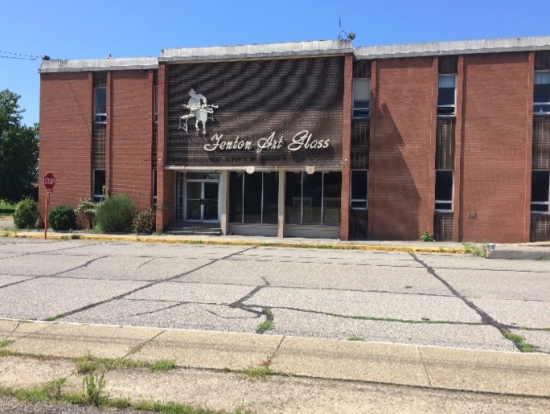 Fenton Art Glass Company’s main entrance soon the grounds will be occupied by a new high school. The last convention we attended was the Fenton Art Glass Collectors of America. Again lots of wonderful people, informative talks and terrific food; most of which was home made. CC Hardman was one of Fenton’s decorators, she showed us how to paint a roses on glass. Russell made a beautiful mum, but I seem to specialize in “modern art”! But the highlight of this convention was a tour of JaBo Marble Factory. 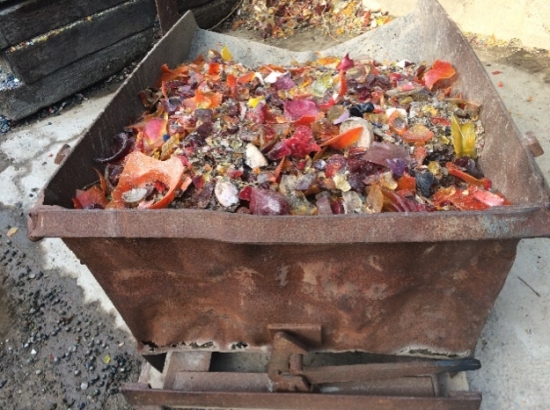 Most of the Fenton cullet was used to make marbles. They let us help ourselves to the bins of marbles many of which were iridized. At one time they had @ 120 employees, but @ 4 years ago, Walmart started to buy their marbles from China; now they have 4 employees! Fenton cullet as it arrives from the Fenton Factory. You can see the broken pieces of bowls, plates, etc. Marble making machine. The second picture is a blow up of the lower middle part of the first picture. It shows the marbles coming out of the tube into the bucket. This plaque was purchased from one of the Fenton Factory sales. We decided it was time to hit the road and get back home. Lots of motorcycles were on the road. Many were veterans with their colorful jackets and American flags going to Sturgis, S.D. for the big motorcycle rally. It was interesting to talk to them at the stops along the way. South Dakota always has a free Legionnaire breakfast for the motorcyclists at one of the rest stops. In Wyoming, there was a rest stop that had a small museum with a small bear, coyote, deer, etc. The kids were enjoying themselves. We did have a wonderful trip and the memories will last a lifetime. Almost 7000 miles in five weeks is a long time to be away. Yes we are happy we made the trip. Bill Crowl, you were very much missed at all of the conventions. R.I.P. We hope and pray that everyone in the path of the terrible storm, Harvey, in Texas will be safe and can return to normal soon.